Sold out makes a statement. Microsoft is cool again as even Facebook Likes Microsoft. Approximately 20,000 (including Microsoft employees and vendors) attended the Microsoft Worldwide Partner Conference in Toronto this year. Icona Pop brought in most mornings with songs like the “I Love It” to support an over all theme of inspiration. If you want an example of how to handle the customer experience and logistics of a large conference, few players do it better than the Microsoft WPC team. Registration took just a minute and there are always conference staff or security every few feet and at every room, door, and escalator. The average fee for the event is approximately $1,995 per attendee. It’s definitely not a cheap affair even with most meals and local transportation provided. Especially, once you add airfare and hotel rates north of $200 nightly. Only the most committed up-and-coming and best Microsoft Partners attend. If you’ve read the current service provider advisory, then you already know the dirty little secret of our industry and the 10 things to know about Microsoft Partners. Not much has changed in the channel, as the number of Microsoft Partners worldwide seems to shrink to about 300,000 in some years and swell to over 600,000 in others. Satya Nadella is right about the hundreds of billions in opportunity in the cloud. However, the AMI Study about more margins in the cloud was based upon a small statistical pool of just 600 partners. It’s also pretty easy to verify that the average margin on cloud services through a distributor is only 9%. The fact is that IT firms make less on cloud. The better bet is likely digital transformation to protect data, while speeding up process and transactions. Successful partners are bundling unique offerings around Microsoft staples to enjoy profitability of 20% or more. However, it’s difficult to image how mixed reality can help the average person outside of industrial or health applications (even though you can see Outlook and a browser too). Regardless, with similar deals like the partnership with GE, Microsoft is poised to be the most popular platform of the future with Azure having double the footprint of Google Compute and Amazon Web Services combined. As usual, there were more than a dozen sessions each hour from 11a – 5p. This is the year of marketing and security and my sessions were split between differentiation and preventing ransomware. In the evening, Matrixforce was a runner up for the Microsoft South Central Partner of the Year. Congratulations to our peer group winners of Team Venti and Prism Technologies Group. The next statement made was quiet, but shockingly deliberate. Most application demos were done using a MacBook or Android phone. Without mentioning it the message was clear: Microsoft apps run on every device. The big announcement of the day was the availability of Windows 10 Enterprise for $7 per user per month. Basically, that means it would take three years to equal the spend of buying a Windows 10 license, while always having the latest features and highest security. If you’re still clinging to earlier versions of Windows, features like Hello and Device Guard should also make you rethink your Windows 10 strategy. Scott Guthrie called it a “generational shift” of organizations moving to the cloud. What many customers still don’t understand is that now is the turning point to adapt or perish. Like a sledgehammer to the brain, the mantra was speed of change and getting prepared to help customers compete. After the keynote, it was time for the Expo and Microsoft Central with a firehose of new products and concepts. Our customers are clamoring for marketing outreach, along with even faster disaster recovery and two potential vendors were identified. The one striking thing about the afternoon sessions was that not one speaker presented in a TED format. You have to wonder about the source of some ideas because there was little attribution. While there were many examples of partner success, the path to getting there never seemed to be fully articulated and there was no identifiable formula. Some of the hidden value in WPC is simply talking with other Microsoft Partners and getting to really know your Microsoft team. The U.S. Party capped off the day at the Sound Academy with free food and drinks, plus a half-dozen celebrities to take pictures and sign autographs. Basketball was the sport in my small hometown of Preston, so naturally I picked Bill Walton. Walton is a legendary two time NBA MVP and an accomplished broadcaster with a net worth over $20 million. In his early 60s, the man stood for three hours in the heat, under bright lights, and actually engaged for a minute or two with each person while taking pictures. Few people, much less a celebrity, would give so much. I told him he was a real trooper for spending so much time with all of us and he said he liked my shirt and thanked me for my kindness. 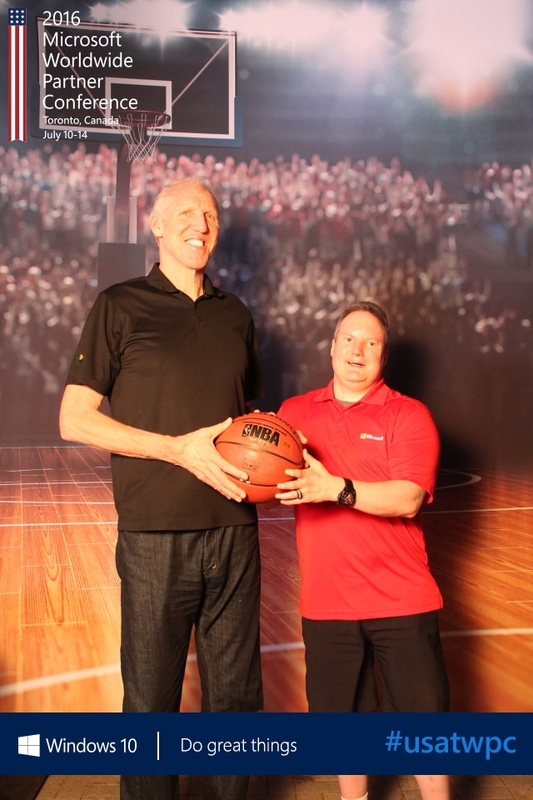 Thanks again to Bill Walton and to Microsoft for making this happen. Have your laugh of the day, as you look at the photo where Bill makes me look like a little kid. The final statement about WPC came from the press in the form of silence. Usually there are a half dozen vehemently critical articles with something more worthy publicized from Apple or Google. Obviously, you have a hard time bashing a company that is doing so much for the planet, giving money away, and making a profit. It was also abundantly clear that Microsoft Cloud Solution Provider was not going away. The future of the channel will be grown from the foundation of just 17,000 CSP partners willing to make the specialization commitment. Apparently, the majority of key Microsoft personnel are moving to different roles. Over 3,500 new employees are being added to assist partners. Partner benefits like internal use rights for products and services have been doubled. As Gwen Stefani did her patented salute at the Partner Celebration, I was reminded how often Microsoft says thank you and the sheer volume of information provided. My staff and I are scrambling to deploy Overwatch and publish examples of digital transformation for customers. I’ll be briefing Guardian clients during CIO Reviews and if you’d like to know more about what I learned at WPC, please ask questions in the comments below.